Change the renderer if you get a black screen when starting the game. SafeDisc DRM[Note 1]. Install Patch v1.18f to remove. The intro video is automatically skipped once start.dat is generated. The version 1.18F patch fixes many crucial bugs and is required to finish the game. Key mappings are stored in <path-to-game>\Default.kmp. start.dat determines the default starting save but saves can still be loaded without it (after completing enough of the tutorial to unlock save/load functions). For a wider FOV see the WSGF entry. 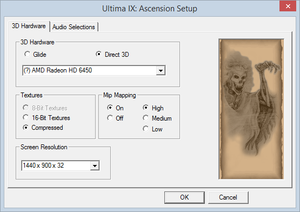 Use Direct3D mode and a 32-bit color screen depth. Edit Default.kmp. 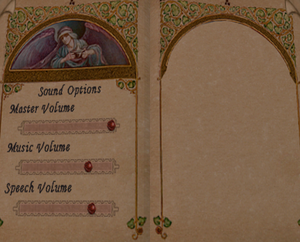 Left and right mouse buttons are hard-coded. Master, Music and Speech. Set in options (Ctrl+O). Enabled by default. Set in options (Ctrl+O). Thai, Russian, Polish, Italian, Dutch/Greek, Spanish and Portuguese retail only have the manuals translated. German retail only; not available digitally. French retail only; not available digitally. Japanese retail only; not available digitally. Change GameScreenWidth= and GameScreenHeight= to your resolution. 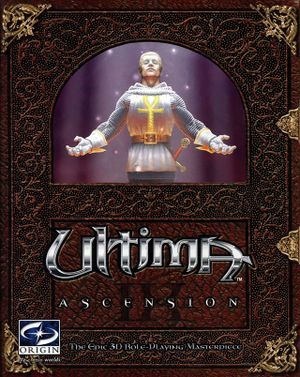 The setup tool may open with an error: "The device you have selected does not appear to support all the functions required for Ultima IX: Ascension." Uninstall any codec packs (e.g. K-Lite). These requirements are for the GOG.com release.